Oily skin is a problem for many people, because it’s often accompanied with other skin problems such as acne, blemishes, and zits. Oily skin can be caused by hereditary problems or hygiene issues, and getting rid of oily skins means pinpointing and treating the cause. The suggestions below should help you get rid of oily skin and restore a clean, shiny, fresh-faced balance to your skin. Washing with hot, soapy water and a drying soap will help you get rid of oily skin. Hot water works as a solvent on the excess oils on your skin and a strong soap with drying action will help cleanse away added dirt and grime, as well as dry out the oils. Something as simple as Dial soap will do the job, or you can look for even stronger soaps designed specifically for oil-removal, like Clearasil, Neutrogena, and Cetaphil brands. Keep in mind, though, that sometimes soap will cause your skin to dry out a bit too much. Use oil-free skin care products to reduce the oil in your hygiene regimine. After washing your skin use oil-free lotions and moisturizers or sprinkle on some baby (talcum) powder instead. This will keep your skin feeling refreshed and moisturized without leaving behind greasy residue. You can also use an astringent containing acetone to further dry your skin (be careful not to use too much astringent if you have sensitive skin). You can find Neutrogena OIl Free Moisturizer at Amazon. Remember to pay close attention to how you react to treatments, that will help you make the most use of this guide. Choose oil-free make-up to prevent and get rid of your oily skin. Don’t use a lot of liquid-based foundation, concealer, blush, or eye-shadow. Choose powder-based products, or products containing acne medication, instead. These will work to dry up excess oil and treat your pores at the same time. Added stress can cause oily skin. Extra stress in your life will strain your body as well, so if you find that your skin is oilier when you’re anxious or busy take the time to wind down and relax. The sweat from a good workout will clean out your pores and refresh your skin, as well. Hormone levels affect the oiliness of your skin. Things like birth control pills or hormone regulators can cause an imbalance in the production of oils in your skin. If you think your oily skin could be attributed to any of your medicatons talk to your doctor about adjusting your dosage, trying an alternative medication, or working with a dermatologist to get rid of your oily skin. Rinse your skin with natural astringents like apple cider vinegar, lemon juice, and witch hazel to reduce oiliness. You can find good cleanser pads from Dickinson’s at Amazon. Clay masks and mud masks are good treatments for oily skin. Masks absorb the oil from the surface of your skin and leave you feeling refreshed right away. The darker the mask, the more oil it will absorb, and lighter-colored masks are gentler and best for sensitive skin. A healthy diet can prevent oily skin. Don’t eat a lot of greasy and fatty foods; the oils in these foods can eventually work their way out through your skin glands. Look for foods that contain unsaturated fats, which are good for you when eaten in moderation, and balance these with lots of fresh produce and vitamins. If the above suggestions don’t help you can always look for skin-care products designed specifically for your problem. Stronger astringents and toners are available, and products containing alpha hydroxy acids work to normalize skin without causing damage or added stress. 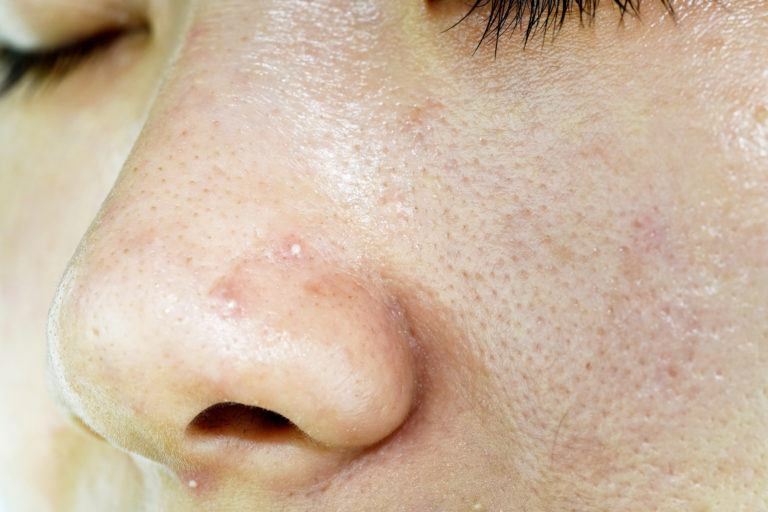 If OTC products aren’t helping you get rid of your oily skin, talk to a dermatologist. A professional can help you pinpoint the cause of your oily skin and develop a personal treatment regimine with prescription-strength products.